Tummy tuck surgery can tighten, slim and tone your midsection. Your loose hanging abdominal skin, excess fat and stretch marks can be removed to improve your overall body contour. The abdomen is one area of the body that undergoes the most significant changes in our lives and tends to be resistant to diet and exercise. If your weight loss is hidden by loose hanging skin and the shape of your midsection does not match the rest of your body, a tummy tuck can add definition to your midsection and dramatically improve your appearance. Weight fluctuation, genetics and pregnancy are the most common reasons for this very popular procedure. 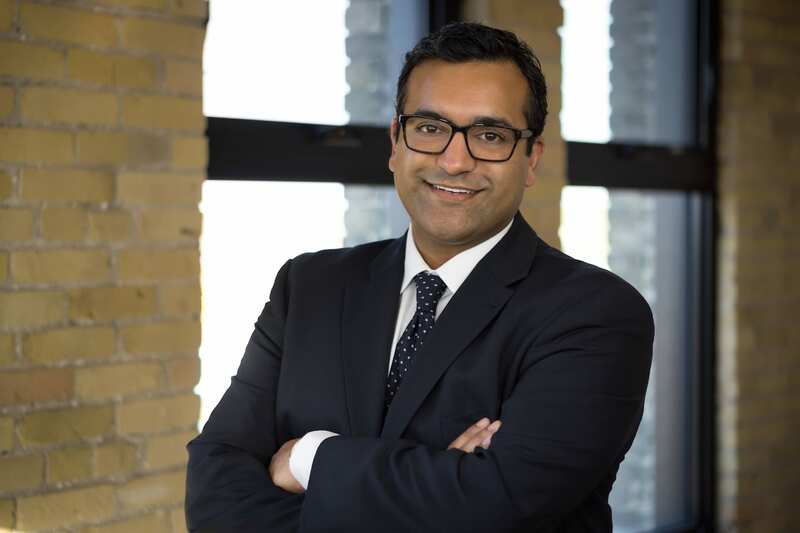 Dr. Avi Islur’s active cosmetic surgery practice is growing with out of province patients who travel across Canada and the U.S for Tummy Tuck surgery in Winnipeg, MB. If you are an out of province patient, please let us know so we can accommodate an appropriate time for your consultation and surgery date. With extensive specialized training and experience in microsurgery and body contouring, Dr. Avi Islur can tighten and tone your abdomen to give your midsection a smooth, firm and contoured shape. 01) Mini Tummy Tuck, 02) Full Tummy Tuck, 03) Fleur-De-Lys Tummy Tuck. Let’s go through all the different types of tummy tuck surgeries together so you can get a better understanding of which tummy tuck surgery will best suit your needs. A Mini Tummy Tuck is a great option if your midsection needs mild correction. This procedure is designed to remove the excess skin and fat below your belly button. The areas above your belly button will not be treated. Scarring is very minimal with Mini Tummy Tuck surgery because your belly button will not have to be repositioned. A well hidden incision line will be created horizontally, from hip bone to hip bone. Dr. Avi Islur will place your incision line strategically so it won’t be visible when you are wearing underwear or bikini bottoms. Please note that the height of your incision line — between your belly button and pubic area — can vary depending on your existing measurements and unique surgical requirements. Your excess fat will be removed then your skin will be gently pulled back down to the bikini line incision. All of the excess skin that hangs down below your bikini line incision will be removed. Mini Tummy Tuck surgery is designed to result in a flat, toned and tight midsection. Your tummy tuck surgery will be custom tailored to your unique needs, individual results may vary. 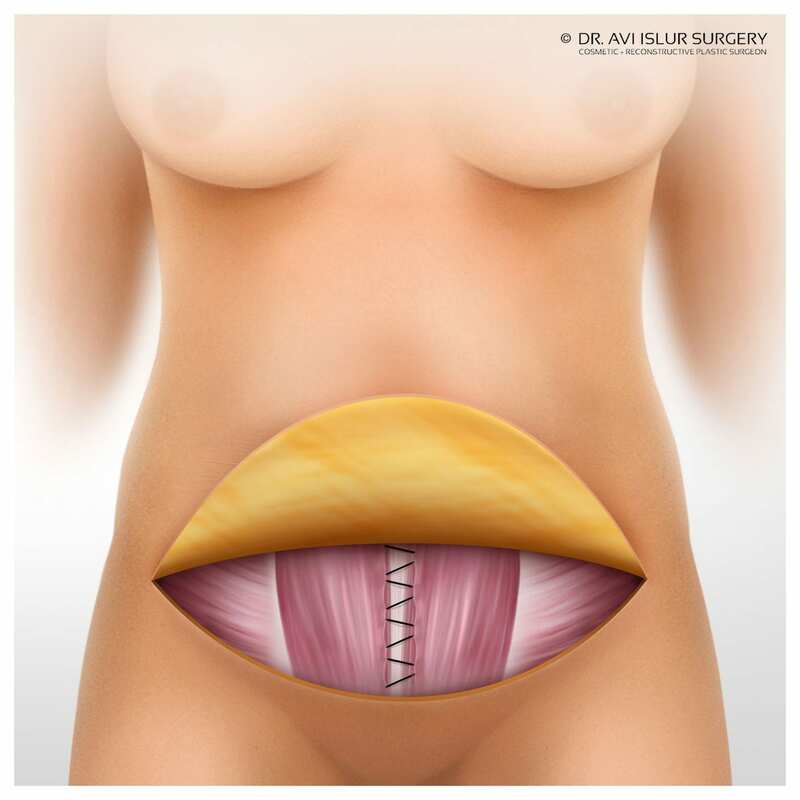 Dr. Avi Islur has illustrated the surgical steps involved with a Mini Tummy Tuck. Below this paragraph you will see 3 images that will give you a clear visual of what you can expect during your procedure. 1) A horizontal incision line is created from hip bone to hip bone, fat is removed. 2) Your skin will be gently pulled back down towards your bikini line incision — any excess skin that hangs over your bikini line incision will be removed, your skin is then sutured into place. 3) Your bikini line incision will continue to fade and smooth out over time. Mini Tummy Tuck surgery is performed under general or spinal anesthetic in 1 to 2 hours. Plan to take about 1 to 2 weeks off work to rest and let your body heal. Doctor notes are available and are very confidential. Your doctors note will not indicate the type of surgery you had. Please note that your tummy tuck surgery and recovery will be custom tailored to your unique needs, individual surgical results and recovery instructions may vary. Mini tummy tuck surgery is often combined with liposuction to create a better overall contour in the hips and thighs. If you are thinking about combining your mini tummy tuck surgery with liposuction or another procedure such as breast augmentation or a mommy makeover, please let Dr. Islur know at the time of your consultation. Crystal gained over 60 pounds during pregnancy. She worked out to lose the weight, however, her loose skin, stretch marks and the post-pregnancy shape of her midsection wasn’t improving through diet and exercise alone. 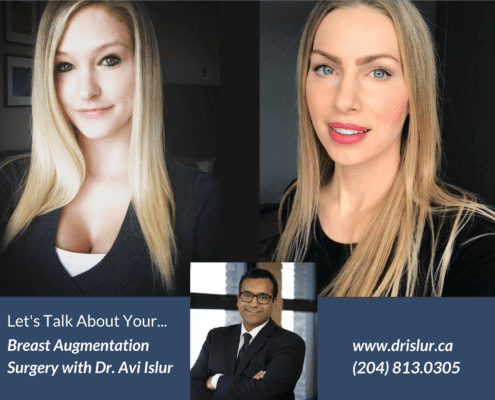 Crystal knew that cosmetic surgery can get the results she desired, so she reached out to Dr. Avi Islur and set up a consultation. Watch this Video to discover more about her personal journey and transformation. Watch this video to learn more about Crystal’s Mommy Makeover and her experience with Dr. Avi Islur as her surgeon. Your tummy tuck surgery will be custom tailored to your unique needs, individual results may vary. 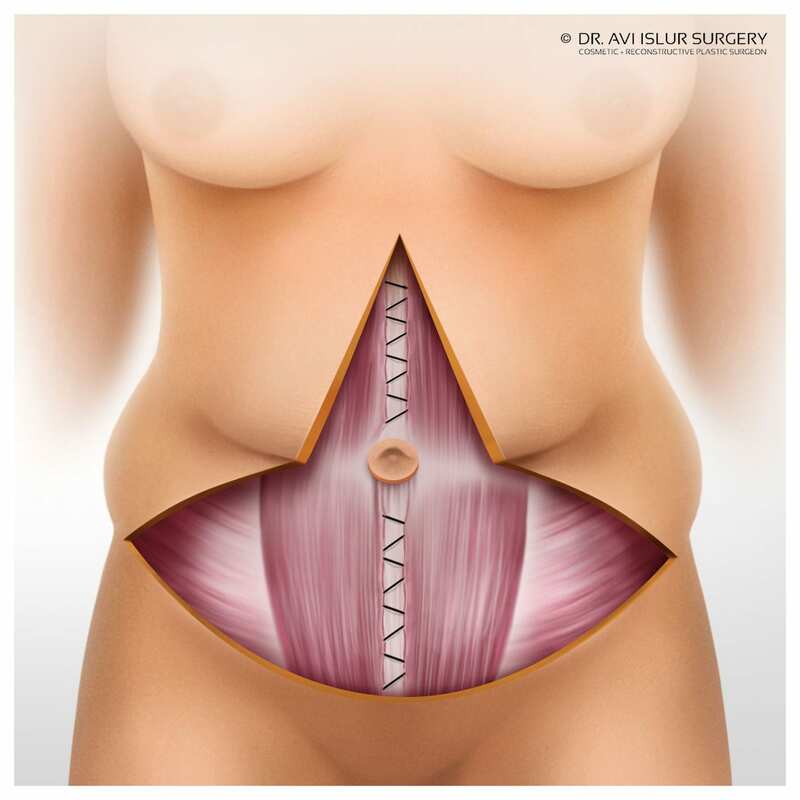 A Full Tummy Tuck is the most common type of tummy tuck surgery that Dr. Avi Islur performs. Your excess fat, stretchmarks and loose skin — above and below your belly button — can be removed and your belly button can be repositioned on your newly tightened midsection. This procedure is great for women who have lost weight or have stretched abdominal muscles and loose skin from being pregnant. After giving birth most women are left with separated abdominal muscles, a common post pregnancy problem called diastasis recti. As a result, your belly can continue to pop out and make you look 4 months pregnant even if you have already lost all the baby weight. Unfortunately, a proper diet and relentless exercise cannot repair your separated abdominal muscles, and loosing the remaining abdominal fat can be very difficult. If you want your pre-baby body back, tummy tuck surgery can get you there. After pregnancy most women combine a Full Tummy Tuck with breast surgery such as breast augmentation or a breast lift. The combination of tummy tuck and breast surgery in one operation is called a mommy makeover. 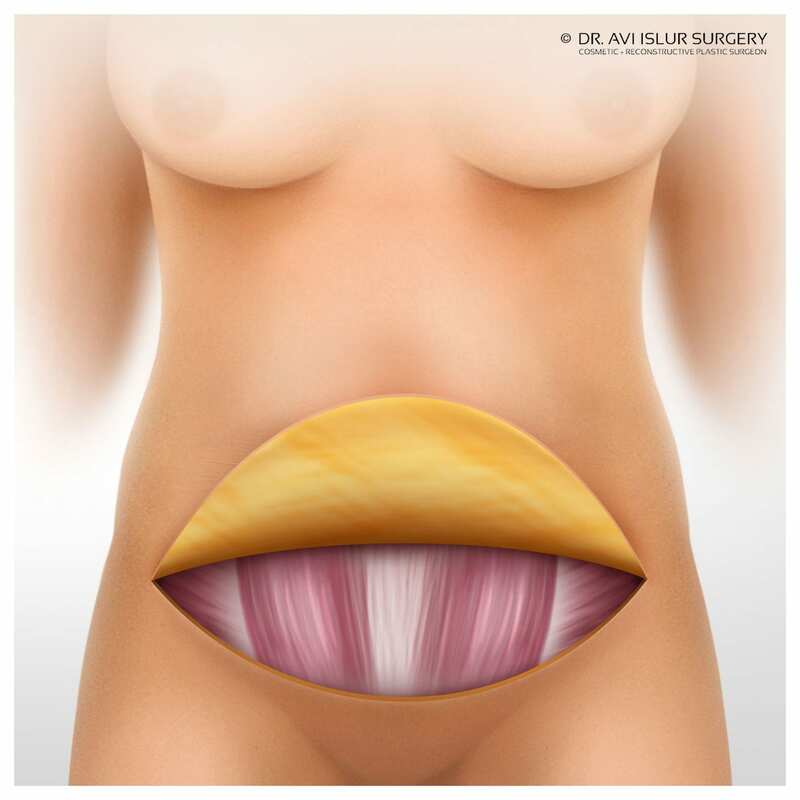 Dr. Avi Islur has illustrated the surgical steps involved with a Full Tummy Tuck. Below this paragraph you will see 5 images that will give you a clear visual of what you can expect during your procedure. 1) A horizontal incision line is created from hip bone to hip bone, another incision is made around the belly button. 2) Your skin will be gently pulled up towards your chest. 3) Your abdominal muscles can be tightened and excess fat will be removed. 4) Your skin will be gently pulled back down towards your bikini line incision — any excess skin that hangs over your bikini line incision will be removed, your skin is then sutured into place. 5) Your incisions will continue to fade and smooth out over time. Please note that the height and length of your incision lines can vary depending on your existing measurements and unique surgical requirements. Full Tummy Tuck surgery is performed under general anesthetic in 1.5 to 3 hours. Plan to take about 2 to 5 weeks off work to rest and let your body heal. Doctor notes are available and are very confidential. Your doctors note will not indicate the type of surgery you had. Your tummy tuck surgery and recovery will be custom tailored to your unique needs, individual surgical results and recovery instructions may vary. 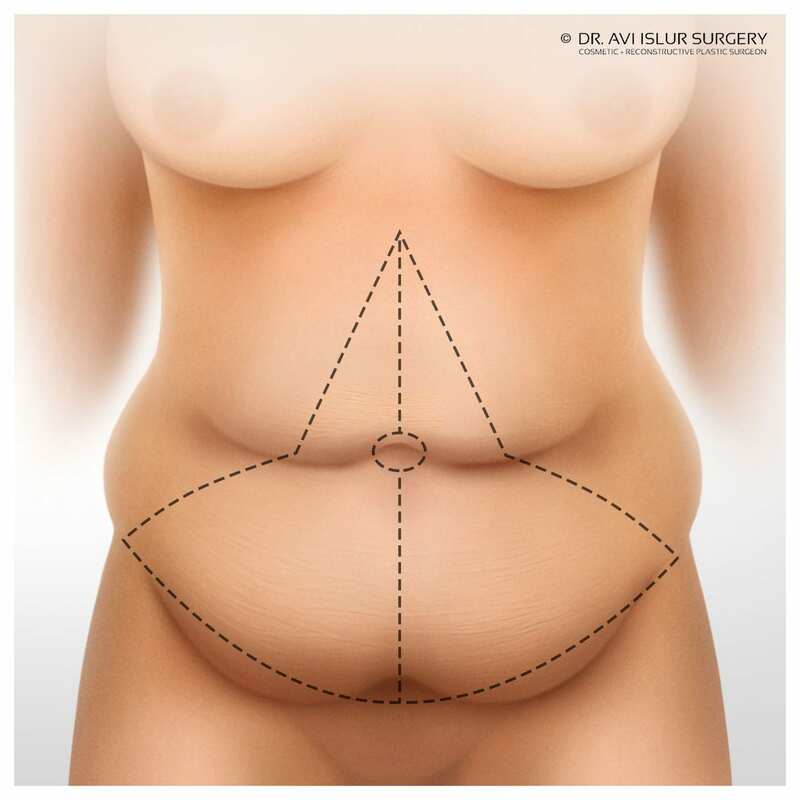 Full tummy tuck surgery is often combined with liposuction to create a better overall contour in the hips and thighs. 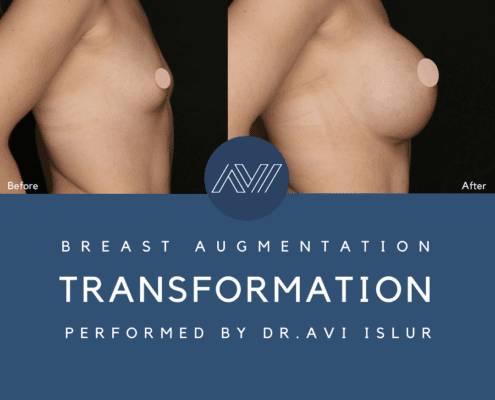 If you are thinking about combining your full tummy tuck with liposuction or another procedure such as breast augmentation or a mommy makeover, please let Dr. Avi Islur know at the time of your consultation. Most patients like to book well in advance, don’t miss out on your preferred surgery date, call 204.813.0305 to reserve your consultation with Dr. Avi Islur today. A Fleur-De-Lys Tummy Tuck is more than a Full Tummy Tuck. If you have a massive amount of hanging, loose abdominal wall skin that is hiding your results of significant weight loss, a Fleur-De-Lys Tummy Tuck is an excellent choice for you. A Fleur-De-Lys Tummy Tuck is designed to remove your excess fat, stretchmarks and loose skin — above and below your belly button. 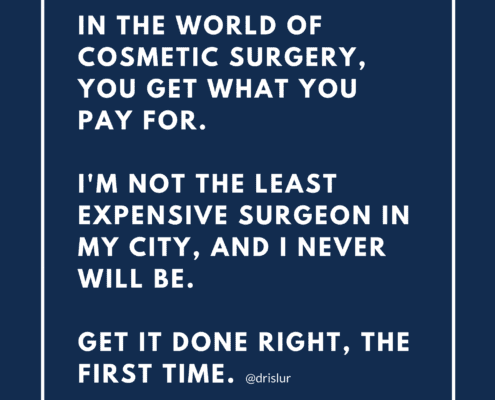 Dr. Islur will also reposition your belly button on your newly tightened and beautifully contoured midsection. If you have lost a tremendous amount of weight you have probably noticed that losing belly fat is a lot harder than losing weight anywhere else. And once your weight loss goals are achieved, there’s a good chance that you will be left with a midsection that doesn’t match the rest of your body. Even worse, your weight loss results might be hidden under a pesky layer of loose hanging skin, excess fat and stretch marks. There is no reason for you to feel uncomfortable in your own skin. A Fleur-De-Lys Tummy Tuck can remove that stubborn belly fat, your loose sagging skin and most, if not all of your stretch marks to complement your new contour. 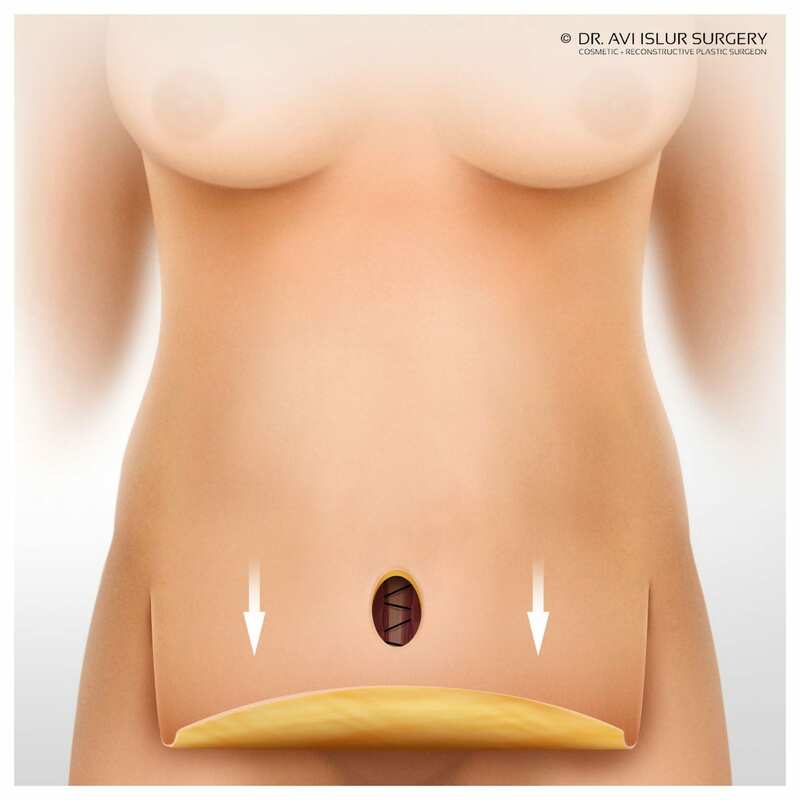 Dr. Avi Islur has illustrated the surgical steps involved with a Fleur-De-Lys Tummy Tuck. Below this paragraph you will see 5 images that will give you a clear visual of what you can expect during your procedure. 1) A triangle shaped incision will be created from hip bone to hip bone and up towards your rib cage. 2) Your skin will be gently pulled up towards your chest. 3) Your abdominal muscles can be tightened and excess fat will be removed. 4) Your skin will be gently pulled back down towards your bikini line incision — any excess skin that hangs over your center line and bikini line incision will be removed, your skin is then sutured into place. 5) Your incisions will continue to fade and smooth out over time. Fleur-De-Lys Tummy Tuck surgery is performed under general anesthetic in 2.5 to 3 hours. Plan to take about 3 to 6 weeks off work to rest and let your body heal. Doctor notes are available and are very confidential. Your doctors note will not indicate the type of surgery you had. Your tummy tuck surgery will be custom tailored to your unique needs, individual results may vary. Fleur De Lys tummy tuck surgery is often combined with liposuction to create a better overall contour in the hips and thighs. If you are thinking about combining your Fleur De Lys tummy tuck with liposuction or another procedure such as breast augmentation or a mommy makeover, please let Dr. Islur know at the time of your consultation. Most patients like to book well in advance, don’t miss out on your preferred surgery date, call us at 204.885.1569 to reserve your consultation with Dr. Avi Islur today. 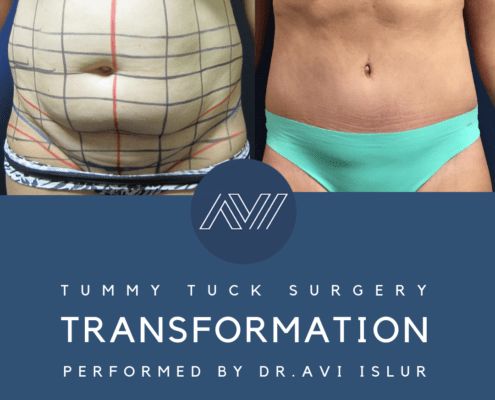 During your initial consultation, Dr. Avi Islur will spend as much time as you need to discuss your tummy tuck surgery and will answer all of your questions. For your convenience, Dr. Avi Islur has provided answers to the most common questions he hears about Tummy Tuck surgery on our FAQ page. Please view Dr. Avi Islur’s Post Operative Care Instructions for Tummy Tuck to get an idea of what you can expect after your surgery. Please note that your tummy tuck surgery will be custom tailored according to your existing measurements and unique surgical requirements. Individual results and recovery instructions may vary. 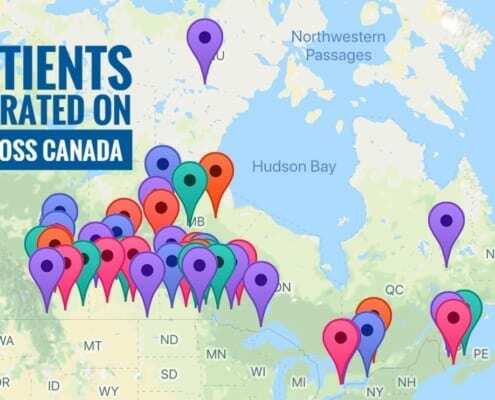 Dr. Avi Islur’s cosmetic surgery practice is growing with patients who travel across Canada and the United States for Tummy Tuck Surgery in Winnipeg, MB. 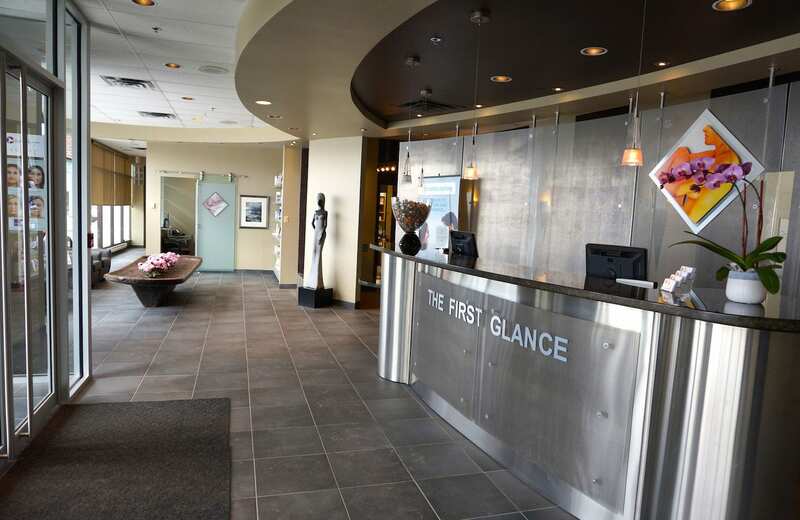 Most patients like to book well in advance, don’t miss out on your preferred surgery date, call 204.813.0305 to reserve your consultation today. Dr. Avi Islur offers RealTime Video Consultations for Cosmetic Surgery patients who live outside of Manitoba. 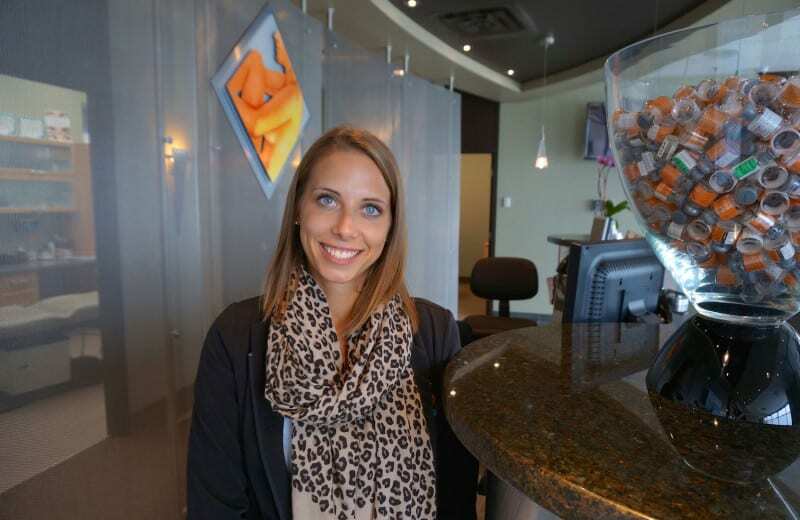 Ideally we would like to see you in-person for consultation. However, we understand that this may not be feasible so we offer RealTime Video Consultations for out of town patients. Your RealTime Video Consultation can take place wherever you have access to a smartphone, an iPad, or computer with a webcam. Prior to your Video Consultation Dr. Avi Islur’s Patient Coordinator will ask you to: 1) Indicate the procedure you are interested in, 2) Upload photos of your area of concern, 3) Complete the provided medial history form. During your Video Consultation Dr. Avi Islur and his skilled medical staff will discuss your aesthetic goals in detail. 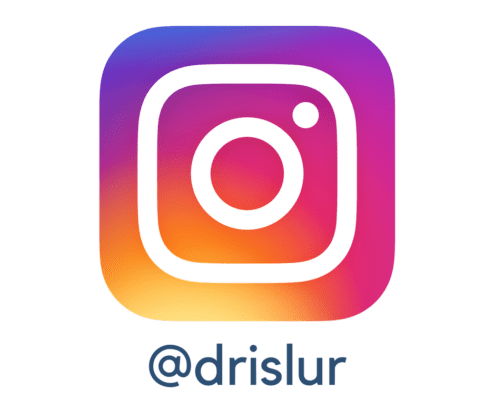 Dr. Avi Islur will evaluate your photos, review your medical history, and discuss your unique surgical requirements to achieve your desired results. Please Note: Some patient concerns are difficult to assess online. You may be asked to come in for a formal in-person consultation in order to best assess your surgical requirements to give the best possible outcome. You can join your RealTime Video Consultation from iPhone, Android, PC, Mac, or Linux. Prior to your consultation you must have access to FaceTime, Skype or WhattsApp.